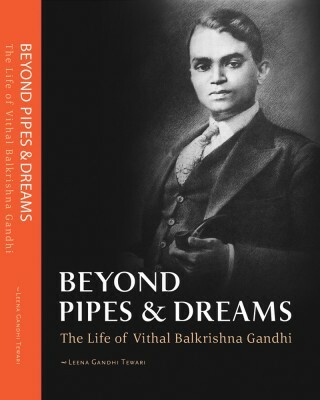 Beyond pipes and dreams is the story of Vitthal Balkrishna Gandhi, authored by his granddaughter, Leena Gandhi Tewari. Who, you may ask, is V.B. Gandhi. To begin with, no, he was not a Gujarati, no relation to Gandhiji. He, in fact, hailed from Ratnagiri, his family name probably coming from the fact that his ancestors traded in sugandh (fragrances). Traders they might have been, in another time, but Vitthal’s father was a humble vegetable vendor, struggling to make ends meet. How he freed himself from the shackles of poverty, depending on education alone, to become a successful businessman, and eventually a member of the first Lok Sabha, is the story of the book. The story begins in 1896, with the birth of Vitthal in Ratnagiri, and takes us through the seven decades of his life in incredible detail. The author, being his granddaughter, would be expected to know some family details, but even then, the extent of her research is impressive. She doesn’t stick to her grandfather’s life alone, but tells us of the circumstances of the time, the place and the conditions, which definitely helps us understand the situation better. The writing, coupled with the photographs, make the book an interesting read. To me, the first half of V.B. Gandhi’s life seemed so much more interesting. It is such an inspirational story. Even in these days, it is difficult for a person of modest means to go and study abroad. Scholarships aren’t easy to get, and neither are sponsors. A hundred years ago, the situation must have been so much worse. Yet, Gandhi found a wealthy backer, who loaned him a colossal amount so he could study in the US, at Columbia University. It is clear that there was a greater regard for education, and greater respect for merit, than there is today. To add to his credit, Gandhi repaid every penny he had taken as a loan during his educational years. He was certainly a worthy recipient. Education might have taken Vitthal from India to America and back, and made him a businessman. However, his strong ethics and values made him the man he was. A major part of the book deals with his affiliation with the Indian Freedom Struggle, and his contribution to society through his work, first in the Bombay Municipal Corporation, and later, the Lok Sabha. It was this latter section which fascinated me, since I realised how little I know about those who made the crucial decisions for our country. There is a reproduction of a photograph in the book, of the members of the first Lok Sabha, and this was the one thing in the book which caught my attention, and held it for a long, long time. These were the first elected members of parliament, and while it must have been among the greatest of honours, it also would have been among the toughest of jobs – to do something first is always difficult, not having anything to fall back on, to be held responsible for every first mistake, to have the new-born country’s future in their hands. How little we know of them! How many of us know even the names of these people? It is impossible to know every one of them, but I wonder if we can recognise anyone in that photograph apart from Jawaharlal Nehru. In fact, after reading the book, I tried searching for the photograph and the names of the members, but found nothing. Absolutely nothing! I guess that speaks more of us than anything. Doesn’t it? Anyway, after that digression, coming back to the book, there is lots of material about his work, his business acumen, his thoughts on India’s progress, of the committees he was involved with, of the crucial decisions he influenced. But it is the personal anecdotes which show us the man within, the man we tend to forget about, reading of his achievements. Especially relevant here is his marriage, his wife, and their thoughts, which, at that time, must have been progressive indeed. This seeps through to their children too, and we can sense the two youngsters growing up privileged, yet deeply rooted in values, where it matters. I especially loved the reproductions of his letters and sketches sent to his family and friends while in America and during his stay in England. They show us a man who studies in the west, speaks and writes English with ease, and yet writes to his friends in his mother tongue, Marathi. His sketches show his attention to detail, even though there are some he draws when he is sick. Especially interesting is his attachment to pipes, which is one of the reasons for the title of the book. This is like a Coffee Table book, interspersed with glossy photographs and quotes. The book quality is excellent, though, obviously steeply priced. Though I am not really a big fan of biographies, I enjoyed reading this one. It simply highlights the need for many more such books, about all the people who made it big in spite of the challenges facing them, those who helped build our country. Heartfelt thanks to the publishers for sending me a copy of the book. Check the website of the book for more details and to order. This book was sent to me for review by USV. The views expressed are my own.